Minions can become any resource in Clan Citadels to meet resource needs for citadel jobs. Clan members can summon minions at an Obelisk of a citadel. Only citadels which are Tier 5 and above can have an obelisk. Although clan members can create minions, they cannot control how minions are allocated. After all other resources have been applied to job costs, minions are allocated dynamically and automatically based on the citadel's job priorities and unmet resource needs. 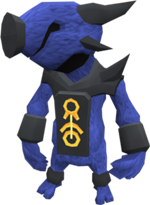 As clan members collect resources, minions can be reallocated dynamically based on the updated resource needs. Minions are allocated to upkeep jobs before upgrade/customisation jobs. If there are more minions available than are required to satisfy the unmet resource needs for upkeep jobs, the amount in excess of that required for upkeep jobs is then applied to upgrade and customisation jobs. Minions are allocated to the highest priority job with an unmet resource need. If there are more minions available than are required to complete a job, the amount in excess of that required to complete the job is applied to the next highest priority job with an unmet resource need. Minions can become any resource to meet the resource costs. Minions are allocated within a job to unmet resource needs, in the following order, until they are exhausted or until the job is complete. If minions complete a job, the "100%" in the job list is yellow rather than green. If the amount of minions collected exceeds the unmet needs for all upkeep, upgrade, and customisation jobs, then excess minions are lost. Minions are not stored in the storehouse. Minions can stand in for any resource, even if the skill plot for that resource has not been built. This is most likely to arise in a tier 6 citadel that has yet to build a barbecue. Minions gathered can still be used for rations, provided that the above conditions are met. Re: Week 13: Loom and Obelisk Added! So it seems that we want to collect Minions right away as they split into other resources and they do not store at all. Loom is slow and we need lots of Cloth: help! We have a few upgrades in process, but they are of secondary concern (T5 Storehouse, T2 Loom, T2 Obelisk, Medium Avatar Habitat). We have easily enough people to get all of them except perhaps the Med Habitat done this week. Let's get moving! Upkeep needs not yet met in Logs or Stone blocks. Upkeep needs not yet met in Logs. Upgrade Stuff: For the T5 Storehouse, we need 82 Metal bars and 252 Cloth -- will ask Meg to collect it. From there we have three more upgrade projects. We should be able to get the T2 Loom if Meg grinds it out. Not sure about T2 Obelisk. Avatar Habitat is still in progress. I think we're up to 21 visits, with everything set to upgrade except the very huge 2nd avatar habitat. We may be @ 22 if Nick visits. Just a +1 but Meg and Ultracook4u did an awesome job of co-ordinating to complete some of our updates. If we can get +2 visits in the next 10 hours that would be exceptional; otherwise I think we'll have to see whether we got our updates. Admin+: please check with our new members to see if they're eligible to visit/cap :)Some have capped, some weren't ready when I checked the other day.